What’s the first thing you do when you arrive in a strange city? Hit the nearest bar, right? Well, me too, except that the bar I’m talking about isn’t the kind you crawl out of hours later with the locals treading on your fingers. No, the kind of bar I go looking for is the kind that I can hang underneath, and then use to pull/lower myself up/down multiple times. Yes, I’ve joined the Street Workout Movement. The street workout program is a methodology based on human movement – bodyweight Calisthenics, basically – but it is rapidly becoming a fitness lifestyle choice for men all over Europe. Why? Take your pick. It works, for a start, and it has for centuries. Ever seen a statue of a Greek God? Never got abs like that through ‘Body by Jake’, did he? A decent street workout will give you biceps like Hercules. That’s a given. Here are 5 more reasons why you should be embracing a decent street workout program while travelling. Social media is doing a lot to raise awareness of the street workout (SW) these days. Guys like Al Kavadlo, Frank Medrano and the Bar Brothers are some of the big-name players in its promotion. Surf around Facebook or YouTube and you’ll easily find designated Calisthenics parks or local playground hangouts for the SW groups. One good thing about street workouts is that it invariably attracts people who are more interested in support, mutual encouragement, and high-five Point Break-style camaraderie. There’s none of the I-can-bench-more-than-you macho BS you find in gyms. You’ll make good friends/tour guides(!) in a short space of time, and you’ll certainly be invited to local bars afterwards. Working out al fresco is like sharing a beer or a smoke or a pick-up basketball game. There’s no language barrier – everyone knows what they’re doing. However, while Calisthenics might look simple, it’s hard. Painfully hard. It’s like violence without the fighting. Expect to routinely inspect each other’s torn-up hands (gloves are for wussies) like a group of apes at grooming time. Maybe lift a guy up by the scruff of the neck as he struggles to stand after that final one-legged squat. You’ll be brothers bonded through suffering after the first session, believe me. You’ve seen, I’m sure, the “hotel room workout” that variously does the rounds in the fitness press. Fitness conscious-travelling men who didn’t want to stuff a set of dumbbells in their hold luggage were advised to utilise the chairs, beds, etc. in their hotel rooms to get a comprehensive workout. Sure, this was Calisthenics-based bodyweight, but even so. In the hotel room? Really? Well, now go to the window and look out. See that? That’s called The World. There’s a lot of things in The World that you can use to get strong. For a start, The World has that thing you’re standing on that it calls The Ground. Also, it doesn’t matter where you go, you can always find a bar to hang from – in a children’s playground, for example. You’ll find benches to step up onto, or a wall you can sit against until your thighs feel like they’re being worked on by the Spanish Inquisition. After a while, you start to look at normal things as potential workout sites. I was riding the Madrid metro yesterday and had to resist the urge to practice my Human Flag on one of the vertical poles in the middle of the carriage. Wonder if anyone’d mind? 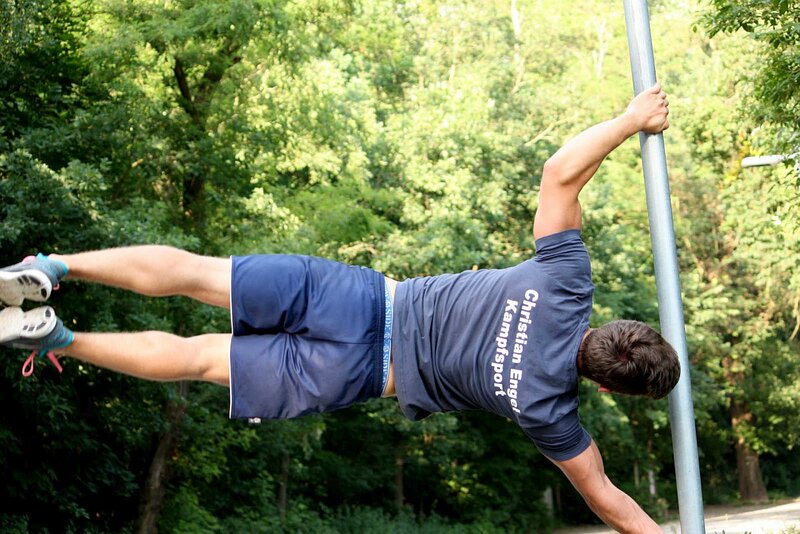 Looks tougher than it actually is: the human flag can be done on any pole in the street. Then again, maybe it’s raining outside? – Who cares? Is that really an excuse to keep yourself cooped up in the gym farm? Wear shorts. Skin is the most waterproof material there is, and doing pull-ups in the rain really makes you feel like Rocky. 3. Release The Primal Urge. Exercising outside and engaging with the environment goes a long way to releasing our inner beast, but the bodyweight street workout is elemental in itself. There’s something primal in being able to move yourself as opposed to moving weight. Sure, you can find examples of ancient peoples who enjoyed moving weight – the lifting of the giant Atlas Stones are staples of any strongmen competition – but to move yourself simply makes you feel that much more…powerful. Primality is all the rage these days in the fitness world, and you can take your pick on exactly how ‘primal’ you want to get. You can embrace ‘Cross-Fit’ for example, which basically takes a number of methodologies (plyometrics, interval training, calisthenics, etc.) and then asks you to perform them to suicidal intensities. Or, you could be an adherent of the recent craze of so-called ‘Spartan’ races. These are basically a run around a farmer’s field that has been turned into an obstacle course. It involves all kinds of things to make you feel ‘tough’ – running through fire, crawling under barbed wire, scaling walls or cargo nets, you get the idea. ... a more cooperative atmosphere in street workouts. The street workout takes more a Zen-like approach to exercise. There’s a large element of concentration and attention to form that is required. These Calisthenics exercises is all about you vs. you. It’s not about absolutes – I can bench 200kg to your 250kg – but it’s about how much more you can do today that you did yesterday. In my book, that makes it about as primal as you can get. The street workout really is a movement in every sense of the word. It’s more than just another way of getting fit. Indeed, while social media may be making Calisthenics more visible and bringing it in to the mainstream public consciousness, the accessibility of it is universal. Why? Because, not only do you not need any complicated kit, it’s absolutely free. We’ve all done it. Bought gym subscriptions at €500-€600 a year. Can anyone say that they really got their money´s worth? Going to a nice warm gym three times a week, watch a bit of MTV, try to find the courage to ask the gym fox out for a drink? Maybe do a little bit of a warm-up and some kind of weights session? A few crunches until it starts to burn? The majority of the time you’re standing around waiting for the guy to finish who’s doing bicep curls in the squat rack, or running in line with ten other people on the treadmills. And you’re paying for that. The rise of the street workout can be seen as a political movement. Fitness for the V for Vendetta generation. Reclaim the streets and stop putting money into the hands of the gym chains. Break out of the gym ‘farms’, brothers. Save your cabbage and unite with your comrades outside on the bars. Calisthenics comes for the Greek works “Kalos” – Beauty and “Sthenos” – strength. It is designed not only to perform feats of strength, but as a celebration of the human form. The beauty that ancient Greek statues exude is well-documented. The symmetry, the mass and the sheer…naturalness of the physiques combine to create an aesthetic which has lasted for millennia. Do women still find muscular men attractive? Some do, I imagine. But, I also imagine that the 21st century girl looks for more than sheer mass. Besides, which looks cooler – a heavy bench press or the Iron Cross on the rings? A massive upper body with skinny legs (you know who you are! ), or a slimmer balance of power and form? Do women prefer the men who are in the ‘farm’ six nights a week, or the guy who gets his fitness fix out in the streets, in the woods or the mountains? I’ve lived like a bodybuilder. At my most massive, I was about 110kg. A lot of chickens died to maintain that. Now, after a year on the bar, I’m coming in at around 90kg. I liked the way I looked at 110kg – my girlfriend didn’t – too big! ), but now, I just feel so much stronger, much more powerful. I gain much more sense of accomplishment than I ever did under the bench press. Now it’s all about inching ever closer to that stable front lever, or holding that Flag. ... regular gym aesthetics. I'll leave it up to you to judge which looks more authentic. The original and best. Works just about all of the upper body. Get down on the floor. Hands shoulder width under the shoulders. Keep your back straight. Lower your nose to the floor. Hold, then push up. Repeat. Tip: Put your feet on a bench to make it harder. Great overall body-conditioner and the one that most gym rats always do wrong. Feet shoulder width apart and flat on floor. Look forward. Put your arms out in front. Lower all the way until your knees are fully flexed. Engage thigh muscles and slowly stand up. Tip: You may need to work on flexibility in your ankles and calves. Grab a high bar with an overhand grip. Feet together. Pull up so your chin is over the bar. Lower all the way down to full arm extension. Repeat. Tip: If you can’t so these at the start, stand on a chair and start from the top position and lower down. These are called ‘negatives’ and will give you the necessary strength to start from the bottom. Go down in press-up position. Rest on your elbows. Maintain straight spine alignment. Hold. Take the pain! Tip: Breathe! See pull-up above, but change your grip from overhand to underhand. Lift yourself up to chin over bar. Lower slowly to full extension. Repeat. Tip: These sets will blow up your biceps like you wouldn’t believe. Not the leg-splayed one-armed push-up of Rocky fame. No, exactly like the two-armed position, but with one arm. One-legged squat, basically, but with your arms out like you’re shooting an imaginary pistol. Needs great strength, balance and flexibility. Needs extraordinary core strength, and massive power in the back and shoulders, this is why you did all those planks and pull-ups. Looks super-cool. Basically, a pull-up followed immediately by a dip on top of the bar. Explosive strength required to get up there, then great power in the shoulder to push yourself up. Need a strong core too to keep you stable. The black belt street workout exercise. Better illustrated in picture than in writing. This is what you’ve been building up to.